The forsythia is blooming. Its golden flowers brighten the landscape and provide a kind of sunshine even during April showers. Gardening is present in the thoughts of those who do and in the stores as well. Pansies and other colorful flowers decorate the entrances of supermarkets and other stores that sell them. Gardening supplies are piled up ready to purchase. Even though it’s not yet time to be planting, these and other signs of spring hearten those of us who are weary of winter’s drab browns and blacks, bare limbs and withered weeds. Gardening runs in my family and in my blood. I wish I could yet I can’t claim the green thumb of my ancestors. My great grandfather planted an orchard of flourishing fruit trees. His apple trees blossomed and bore from the onset of spring until deep into fall. His quince trees produced fuzzy hard fruit that with my mother’s diligent efforts became jelly and preserves. In her garden she grew a variety of vegetables. I can see her still working away in it, her tanned back brown in the sun. My grandmother had a gardener named Mr. Patch. He was Irish. I remember his nut brown face and his wonderful brogue as he discussed with my grandmother what he needed for the garden. She did some work also, principally with her pruning shears as she picked her magnificent roses. She grew both flowers and vegetables, harvesting and eating from her garden all summer long. 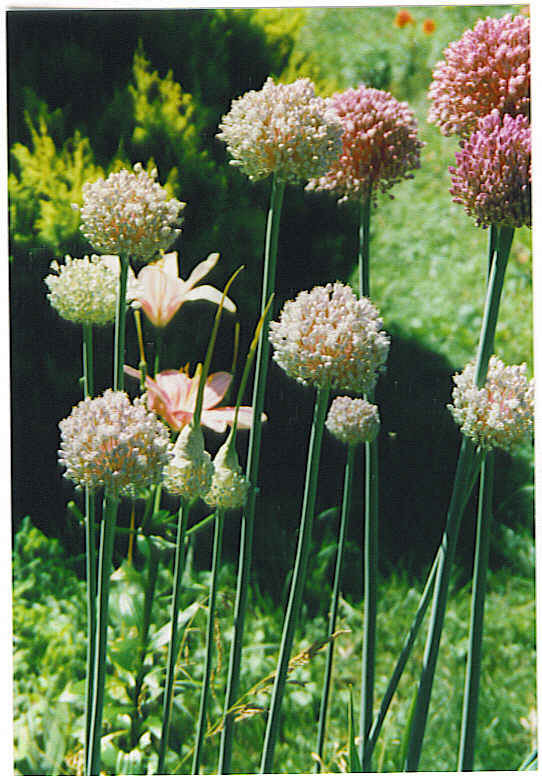 What I remember most clearly were her glorious gladiolas, the saucer plate dahlias ranging from deep red to bright orange and yellow, and the colorful zinnias that lined the gravel path leading from her driveway to her door, bounded by a white picket fence and two strips of green grass turf. My father too grew roses and later brought back some young peach and plum trees from a horticultural show, planted them and then harvested the fruit when they grew old enough to produce it. I did have one experience with a fruit tree. 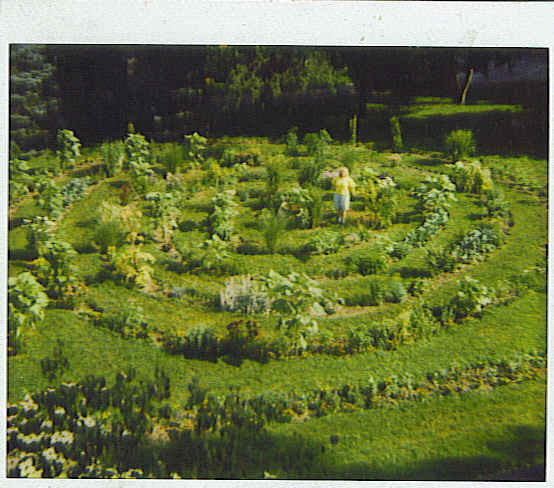 Back when I had my spiral garden I had bought what I thought was a white forsythia to plant there. After three years it hadn’t flowered. Reluctant to discard it, I dug it up, replanted it at the edge and forgot about it. To my great surprise and delight, though now in the shadow of a large spruce, it grew into a white peach tree that produced three peaches its first year and many more after that. These days my gardening is limited to a few potted plants. Perhaps one day I will have a small garden again, however I couldn’t manage anything very much more than the original three by five foot plot I was given as a child for my own. I grew flowers there, and then weeds by the time August rolled around. But it got me started on many years of garden tending. These days I write poetry about gardens together with other aspects of nature and the world I live in. My gardens have become metaphysical rather than physical, and truth to tell my back is grateful. As a child I so looked forward to school vacation and the freedom it brought from discipline, homework and schedules. Whenever weather permitted, my time was spent out doors wandering around the rather large property where my parents and I lived. It belonged to my Great Aunt Alice, whose father had built the grand house she lived in now, as well as the cottage originally intended for the gardener. That was where I, and later on my brothers and sister lived. There was a broad, open field to roam in, trees to climb, and a small marsh bounded by a dyke that kept out most of the distant seawater. 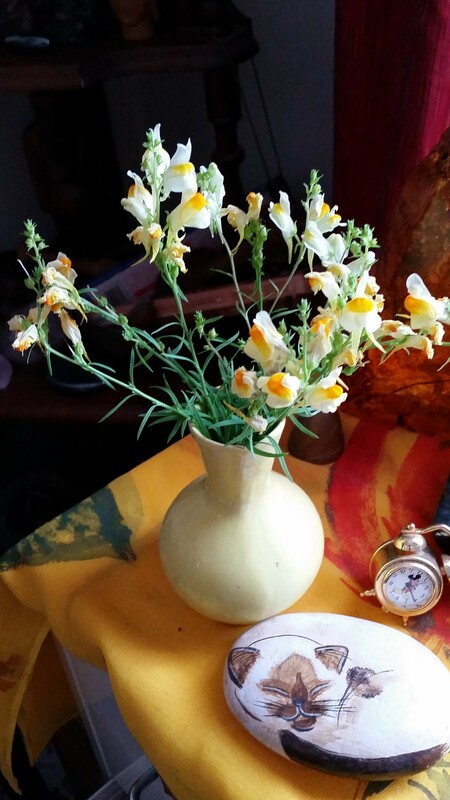 Wildflowers grew in abundance, insects buzzed and birds called. There were trees to climb, and I also spent time high in their branches, reading. 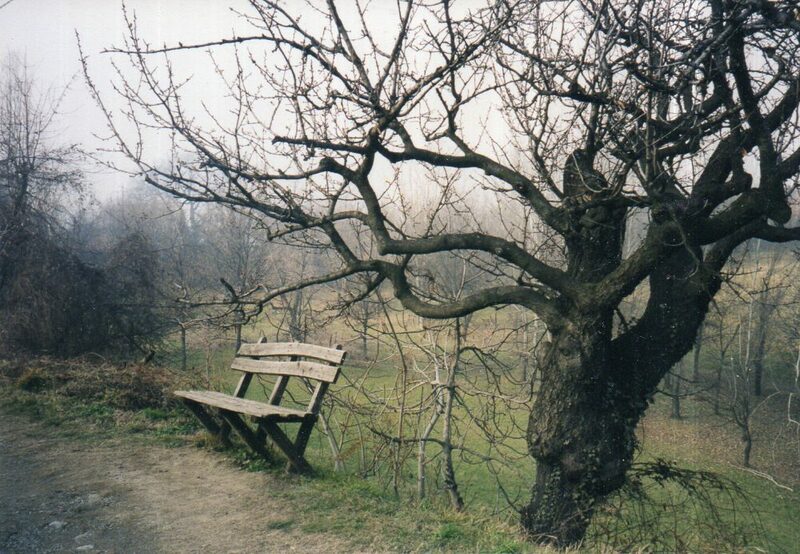 I called it my tree house and brought pillows to the platform I had wedged into my favorite tree, a big beech. Summer was a time to play. The property held plenty of room for my imagination to conjure up all kinds of adventures like the ones in the stories I read: Tarzan, Robert Louis Stevenson’s tales, and the legends of Greek heroes. Time passed and I was a young mother. Summer meant days at a nearby beach watching my children play in the sand and splash in the waves. Fortunate to be able to stay home with my children, I hung the laundry in the sun, worked on my tan, and took the them to the local church fairs, the annual carnival, and whatever other amusement the season offered. We had picnics and explored the highways and byways of surrounding towns. Later there were softball and then baseball games they played in to attend. The work of motherhood became a kind of play in summer. Fast-forward to a different kind of summer life, with a swimming pool to clean and care for and a large garden that took me almost as much time to look after as the children did. Still it was a delight to share the pool as well as the garden with visitors. I didn’t mind the weeding too much, or pruning the shrubs. It was an adventure to tackle the wild rose vine I planted for its delicious scent, without realizing the consequences of its rampant growth. I never knew how many would be sitting down to any meal, because people came and went as I practiced my hospitality. Summer held a different kind of play. My summers have changed again. With age comes less tolerance for extreme conditions. My bones enjoy my home’s warmth in the cold but not its heat in the muggy weather. I appreciate air conditioning far more than I used to, and I spend much more time indoors than I did in the past. While the long summer hours of light are enjoyable, the effect of the heat on my mind is not. Labor Day signals summer’s closing. Once I welcomed its beginning with open arms, now each year I am more appreciative of summer’s end. My late son Robin was a gardener by nature. He loved plants and grew them with joy. Whatever he chose to plant grew well for him. He loved growing his own vegetables and harvesting them to cook for himself. As do the Native American peoples, he believed in giving back to the earth whatever was taken from it. Toward that end when he harvested his vegetables he would always give back something to the ground where they were planted. He helped me with my garden when I had one, however my gardening days are now over and I no longer have the physical space to grow seeds and plants. Nevertheless, each spring I grow something in his memory. I call it Robin’s memorial garden. I create it not with seeds but with recycled carrot tops. I always have carrots in my refrigerator. Carrots are one of my staples. My vegetable drawer is never without a package of organic carrots–you never know when you’ll need one for soup, salad or just a vegetable for a meal. In the spring, when I take them out, the tops often have sprouted just a bit. These sprouts are my cue to begin Robin’s annual memorial garden. I cut about a half to three quarters of an inch or so off the top of each sprouted carrot and place it in a shallow dish on my kitchen counter. There they will get some light. After a while green feathery tops appear. These will grow until they have exhausted the nourishment left in the carrot. This is what I call Robin’s garden. Sometimes the carrot stubs grow little roots. I have read that if I were to plant them–which I have not done, they might grow another carrot. I watch with pleasure the little green sprouts grow and think of my son and his green thumb. While he is no longer growing anything on Earth, his life has inspired wonderful growth here, both for me and for his sister, my daughter Laura. She has done and continues to do valuable work to bring awareness of and assistance to those with traumatic brain injury. In life, Robin sustained a number of concussions as a result of his enthusiastic pursuit of ice hockey. Today my daughter has not only written extensively about traumatic brain injury she has also worked as an advocate to be of help to those with this condition. In the year after he died I decided to create a body of work in his memory. He loved poetry. As a memorial to him, I began a deliberate focus for myself on what I call the poetic eye: a way of looking at life from a poetic perspective. Since his death I have written many hundreds of poems. This work is also dedicated to him. I know that there are others who have been inspired by him as well. He goes on living in their efforts. While I regret deeply that he is no longer on earth, I celebrate his life with my remembrance and with these little carrot tops that I grow each spring. I am a gardener caring for my garden. wakes and returns to sleep. Nature alternates between rest and growth. dutiful my days, tranquil my nights.